경주향교는 처음 지어진 시기는 잘 알 수 없으나, 조선 성종 23년 (1492)에 경주부윤 최응현이 중수하였다고 한다. 임진왜란 때 소실된 것을 선조 33년(1600)에 부윤 이시발이 대성전과 전사청을 중건하고, 선조 37년 (1604)에 부윤 윤성이 동·서무를, 광해군 6년(1614)에 부윤 이안눌이 명륜당과 동·서재를 중건하였고, 이 때 제독청 전면에 연못과 작은 누대(樓臺)를 꾸몄다 한다. 효종 6년(1655)명륜당 북쪽에 송단(松壇)을 쌓고 현종 10년(1655)송단 동쪽에 존경각(尊經閣)을 신축하고 동,서무를 중수하였다. 이 때 부사(府使)민주면(閔周冕)이 유생과 상의하여 임해전(臨海殿)터에 있던 고 석물들을 가져다 과거에 없었던 계단과 정로(正路)를 만들었다고 한다. 이 향교는 경상북도 내에서 규모가 큰 편에 속하며, 건물 배치는 나주향교와 함께 향교의 표본이다. 경주향교는 계림(桂林)의 서편, 문천(蚊川)의 북쪽에 위치하고 있다. 경주향교 부지는 신라때 요석궁이 있던 곳이라 전해오며, 향교는 정남에서 동쪽으로 약 10도 가량 틀어져 앉아 있다. 경주향교는 대설위(大設位)향교이다. 평지에 입지하고 있는 경주향교는 외삼문(外三門), 신삼문(神三門), 대성전, 명륜당이 남북 축선상에 자리잡아 남향하고 있으며, 문묘영역이 강학영역 앞쪽에 위치하는 전형적인 전묘후학(前廟後學)의 배치형식을 따르고 있다. 경주향교 건축물 중에서 대성전은 연혁이 분명하고, 공포와 창호 및 가구에 고식의 기법이 잘 남아 있으며, 대성전 종도리에서 발견된 상량 묵서명을 통하여 대성전의 중건년대와 당시 참여한 장인등의 역사적 사실을 확인할 수 있어 역사적, 학술적, 건축적으로 가치가 크다. 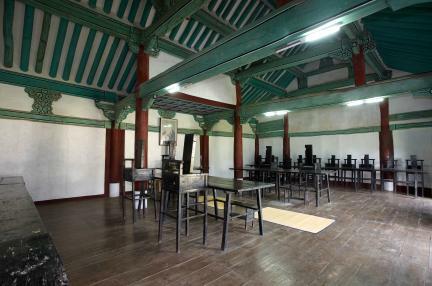 Although it is not precisely known when Gyeongjuhyanggyo Local Confucian School was constructed, it is, however, known that it was renovated in 1492 (the 23rd year of King Seongjong’s reign), by Choe Eung-hyeon who was the magistrate of Gyeongju at that time. The local Confucian school was burnt to the ground during the Japanese Invasion of 1592. 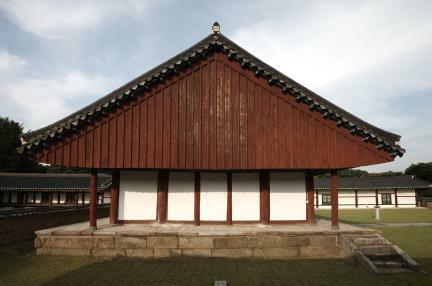 Daeseongjeon Shrine and Jeonsacheong (Depository of Ritual Utensils and Offerings) was rebuilt in 1600 (the 33rd year of King Seonjo’s reign) by Gyeongju Magistrate Yi Si-bal. The east and west arcades were rebuilt in 1604 (the 37th year of King Seonjo’s reign), by Yun Seong, and Myeongnyundang Lecture Hall and the east and west side-buildings in 1104 (the sixth year of King Gwanghaegun’s reign), by Yi An-nul. A small pond and a pavilion were added at this time, outside the Jedokcheong (Office of Academic Councilor). 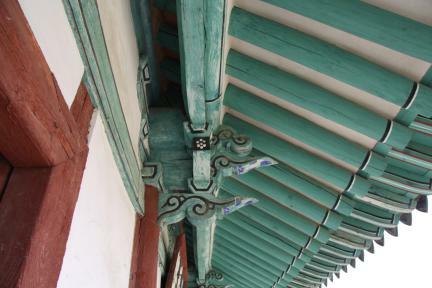 In 1655 (the sixth year of King Hyojong’s reign), the Songdan Altar was set up in a location just north of Myeongnyundang, and in 1669 (the tenth year of King Hyeonjong’s reign), Jongyeonggak Library was constructed east of Songdan, and the east and west arcades were repaired. It is said that, at this time, Gyeongju Magistrate Min Ju-myeon had stone structures at the former site of Imhaejeon Palace brought in for use in the landscaping of this waterfront garden, to make steps and paths, after discussing the matter with the students of the academy. 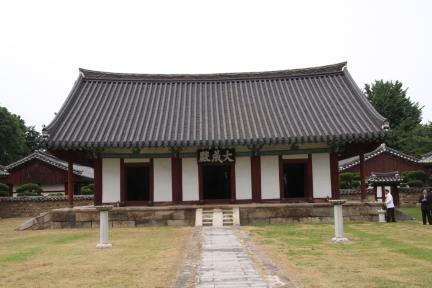 One of the largest Confucian schools in Gyeongsangbuk-do, Gyeongjuhyanggyo is considered a reference in terms of layout of buildings, as is Najuhyanggyo Local Confucian School. Gyeongjuhyanggyo is located west of the Gyerim Forest and north of the Muncheon Stream. 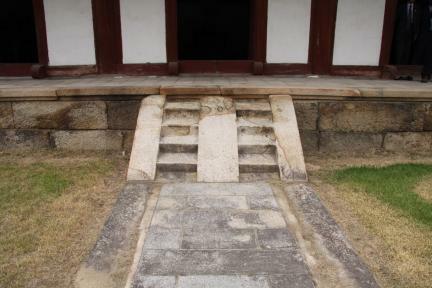 Yoseokgung Palace is said to have stood at this site, before the Gyeongjuhyanggyo was built there. The Confucian school is oriented about ten degree from due south. 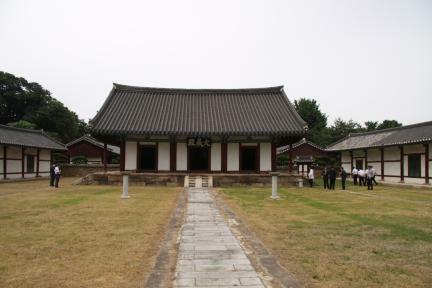 Gyeongjuhyanggyo is a high-level local Confucian school. Constructed on level land, it has its main buildings and structures, including the outer triple gate, divine triple gate, Daeseongjeon, and Myeongnyundang, distributed along the north-south axis. 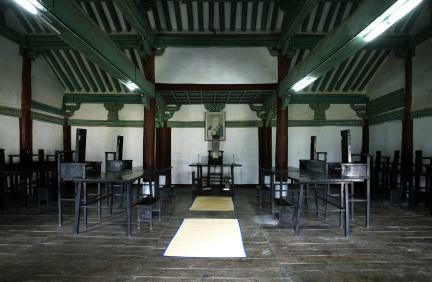 It assumes the typical layout of a Confucian school in which the shrine is near the front entrance, and the lecture hall lies further back on the lot. 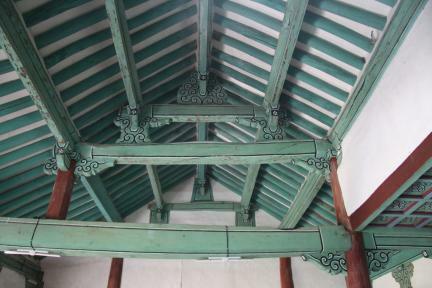 Daeseongjeon Shrine is of particularly high historical and architectural significance, as its chronology is clearly known, and the construction style of this period is well preserved in details like columnar brackets, door and window latticework and built-in furniture. 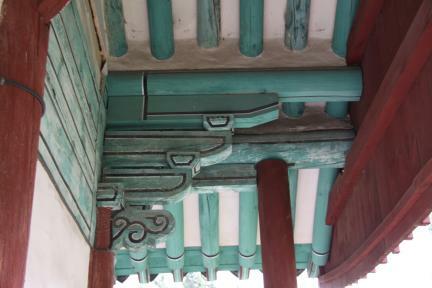 Information including the date of renovation of Daeseongjeon and the names of artisans who were involved in the renovation is found on a ridge beam of Daeseongjeon, written in ink.